The more I learn about entrepreneurship, social resilience, and systems dynamics like emergence and self-organization, I haven’t stopped thinking about how Ultimate Frisbee is a fascinating example of many of these concepts — in a game. Our readings for Game Design class last week discussed “big games,” those played by many people in larger spaces (Capture the Flag, dodgeball, and Werewolf Mafia are among the better known big games). Ultimate has its roots in this culture of fun competition and is spreading in a uniquely emergent way, starting on liberal college campuses and slowly mainstreaming into high schools and even professional leagues. The sport is certainly not conventional, and yet it’s played at most colleges, many high schools, and in communities all over the world. It’s worth examining the potential causes of this unlikely phenomenon, especially in the context of how the game is designed. Ultimate was invented by a bunch of high school students in a parking lot in New Jersey tossing around pie tins, which they quickly iterated into a fast-paced and dynamic game that mixes aspects of football, lacrosse, and handball, but with a 175-gram plastic disc. The game begins with seven players to a side on 70 yard long fields with an end zone at either end. The object is to advance the disc in the air into an end zone. Players can’t run with the disc; they must stop and throw it within ten seconds. If the disc is dropped or intercepted, play changes direction immediately (offense switches to defense). Once a point is scored, there is a “kickoff” similar to football, and play doesn’t stop until a point is scored. It’s a game of fast cutting and transitions, long throws, out-jumping opponents, and diving catches. Ultimate is self-officiated, making it a sport that demands genuine and fair play. Athletes must communicate clearly and respectfully, and make speedy, unselfish compromises for the sake of fair competition. The game emphasizes strategic problem solving, collaboration and cooperative leadership with an evolving set of rules. In 2007, the 11th Edition was released to include revisions of several important rules based on player feedback and national voting in a democratic system. There are many unique aspects of Ultimate that are cultural, resulting in a tightly knit and almost counterculture community. There are no referees; play is with a disc, as opposed to balls; and there are co-ed (“mixed”) teams, which is very rare in high-level sports. We have atypical yet universal memes. There are often silly interactions with opponent teams after a game is played. Games like Ninja, dance-offs, and huge games of Ro Sham Bo are common. Senior players give nicknames to rookies. Like our readings on Quidditch and Ninja, Ultimate does a great job of encouraging group ups to let their guards down. 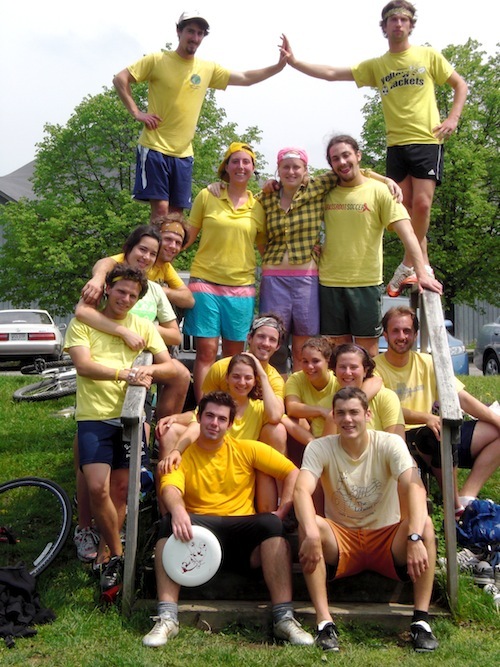 As college players, we volunteered to play the club sport. Our teams didn’t get much financial backing from the college, yet we practiced 10 hours a week and went to dozens of tournaments proudly representing our school. We played and partied together, extending our community into the greater student body, and growing our reputation as fun-loving and goofy but committed athletes. The “flat management” leadership, quirky and unpretentious culture, and self-organizing play makes the sport popular among tech startups and entrepreneurs. In New York City summer leagues, my teammates have been ER physicians, software engineers, and investment bankers. Like video game avatars, players have the freedom to create their own identity, which manifests in the three or four field positions and can extend to roles off the pitch (we had a “cheer captain” on my club team who would lead us in creative cheers, heckling, and chants). Ultimate welcomes the supremely athletic to the uncoordinated nerd; the nonhierarchical structure is compelling to subversives and creatives, while appealing to athletes who love its nonstop running and team dynamic. My college team was comprised of lettered varsity captains and women who’d never run a mile before their first Ultimate practice. I’ve scrimmaged with grad students in Japan and picked up with Peace Corps volunteers in Ethiopia. The emergent quality of Ultimate is also evidenced in the way people are introduced to the sport. My friend Evan, who studied cognitive science in college and now works at Google, explained it thus: “Most people who learn about ultimate do so through a friend who plays it, as compared to many mainstream sports which have large broadcasts and newspaper sections dedicated to them. This makes it a very personal and communal system from the beginning.” Evan’s summer camp counselors introduced him to the sport (they were college players). I was introduced to Ultimate by friends in my freshman year dorm. They knew I played other sports, and coaxed me into attending a 6:00 AM winter practice; I’ve been addicted for the 7 years since. It will be interesting to watch the system adapt to growing broadcast coverage in ESPN highlights, exhibition games, and professional leagues. Will the sport become less cultural and more about athletic competition? Or will the social benefits that attract curious young players to the community trump the sport’s privatization? Writer Dave Gessner says the “unfortunate distinction of being played with a child’s toy” means that Ultimate still has a tough time escaping the “taint of the whimsical” even though it is a physically exhausting and entertaining sport of incredible athletic feats. This essay was originally written for my Game Design class with Matt Parker and Asi Burak on February 14, 2013. Tags: community, emergence, game design, systems thinking, ultimate. Bookmark the permalink. In the NY Times today!